Huge bang for the buck in a 27' cruiser with all the basics for worry-free cruising. 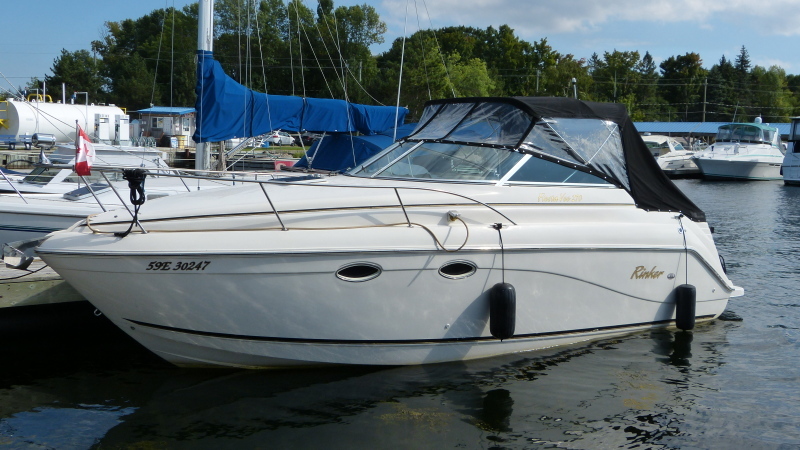 This freshwater Rinker 270 Fiesta Vee is very clean and appears in excellent condition inside and out. She is built on a solid fiberglass hull with a self-bailing fiberglass cockpit liner, a walk-through windshield, electric engine hatch, well-appointed cockpit and extended swim platform. Below decks is a full galley with stovetop, microwave oven and dual voltage fridge. The forward cabin area includes a u-shaped dinette that converts to a large double V-berth. The mid cabin aft provides accommodation for two more adults. A single inboard/outboard Mercruiser engine provides plenty of power when needed, and delivers great fuel economy at cruising speed.